There are many things to look for when you compare funeral plans. The cost is not always the only factor to keep in mind. With so many products available, where do you start when looking at benefits? We have decided to make a little breakdown of all the providers we offer. Here you can have a quick policy comparison. On this page, you will be able to see policies side by side. Firstly, it is important to understand what to compare. You need to look at the type of policy. Some policies offer just a cash payout, where other offer cash and benefits. Secondly, you need to look at the extra benefits available on the plan. Lastly, you need to look at the cost of the funeral policy. All great providers will have some extra benefits. These benefits can sometimes add a lot of value. Sometimes, they are just there to lure the client. We have seen funeral plan that come with free airtime. This type of funeral plan is often not very professional. We always make sure the policies we offer have benefits relevant to the product. It is of no benefit to be receiving free ice cream when you claim. The benefits must make the product better. Luckily, we only represent the best funeral plans in South Africa. All the products we represent are well established and come with amazing extras. The benefits mentioned below are not everything available on each plan. The comparisons below are just a brief overview. All of the providers offer additional benefits. The tables should serve as a basic guideline of what they offer. To compare each provider in full, feel free to visit each separate page. On the provider pages, you will find more info on each company. Please note some of the benefits listed on the tables are optional benefits. Some optional benefits have an extra charge. When we arrange your quote, we will be able to give you exact figures. At funeral cover quotes, we can help you find the best policy for your needs. When you complete our contact form, we contact you via telephone. This way we can explain everything to you in person. Our experience staff will help point you into the right direction. We know how to compare funeral plans. The quickest way to compare funeral cover is to look at the benefits side by side. When you compare funeral cover, you need to know how much cover you need. Most providers have similar cover amount, this is because the industry is regulated. 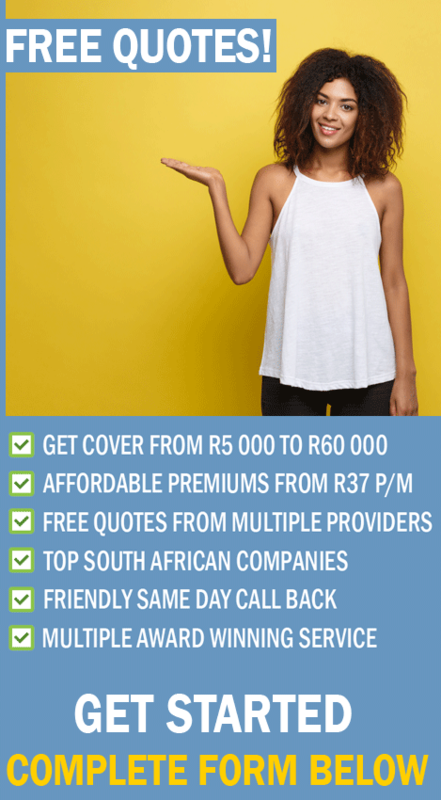 The lowest amount is usually around R5 000 and the highest we offer is R60 000. For a decent comparison, you need to know what your needs are. We do not offer providers with useless benefits. Although this is something you need to spend some time on. To explain what the problem is you need to understand the importance of policy benefits. In the past, we have come across providers who offer client benefits that do not improve the product. Sometimes fly by night providers lure customers with benefits they will never use. The problem with this is at the end of the day, you pay for those benefits. For example, there is no reason you should get discounts on armed response on your funeral plan. We have even seen some funeral policies that arrange discounts on books. Make sure when you compare products you look at the benefits. All the above policies have a 6-month waiting period. This waiting period will only be for natural death. Accidental death will receive cover from the first payment. This is an industry standard. It prevents the sick and dying from taking out policies at the last minute. Remember there will be no medical questions or exams. All the companies will guarantee your acceptance regardless of your health status. Be careful of funeral insurance policies that do not have any waiting periods. In our opinion, this is a red flag. It’s an industry standard and prove that the company knows what they are doing. Most providers will settle claims within day or two. Make sure you look at how quickly this process is done. You do not really want to get a funeral plan that takes more than 48 hours to pay claims. Funerals must be arranged quickly after death. All the companies we offer settle claims between 24 – 48 hours. The above are just some of the things you need to consider. Let us go through everything with you. We know the benefits of all the products we offer. After we determine your needs, we can suggest some options. Once you finished comparing your funeral plan providers, feel free to contact us to get started. Compare Funeral Plans Above, or speak to an agent.